Albert Palmer was born in Yeovil in 1846, the son of Leather Dresser Charles Palmer (1815-1892), originally from Stoke sub Hamdon, and Ruth née Lye (1818-1906) originally from Martock. In the 1851 census Charles and Ruth, together with their three children; William (b1844), 5-year old Albert and Elizabeth (b1848), were living in Reckleford (today's Market Street). By 1861 Charles had moved his family to Middle Street, next door to the glove factory owned by Elias Whitby Jnr, where the Glovers Walk shopping precinct now stands. The family were a typical Yeovil family of the time involved in the leather and gloving industries; Charles was a Leather Dresser, Ruth was a Glove Sewer as was her 13-year old daughter Elizabeth, while 17-year old William and 15-year old Albert were both Glove Cutters. In the autumn of 1863 Albert Jnr married Eliza Young (b1842) at Yeovil. They were to have six children; Albert Edward (b1864), Ernest (b1870), Elizabeth (b1876 and known as Bessie), Lillie (b1877), Stanley (b1881) and Clara (b1883). In the 1871 census Albert and his family were living in Newton Road where he gave his occupation simply as a Glover. The family moved again during the 1870s and by the time of the 1881 census were living in Stars Lane. Again Albert gave his occupation as Glover while Albert Jnr, now aged 17, was a Clerk. In 1885, with a wealth of gloving knowledge behind them, as well as Albert Jnr's experience as a Clerk, Albert and Albert Jnr set up their own glove manufacturing company, trading as Palmer & Son. Unfortunately the business became severely in debt within the first year and in August 1887, due to their combined ineptitude in running a company, Albert and his son were declared bankrupt. In his defence Albert Snr blamed the failure of the company on want of capital, depression in trade and damage to leather in dying. He also stated that he had never taken stock. The Official Receiver's pointed observations were "The senior partner of the firm stated that he only became aware of his insolvent position in May last, but such a statement on the face of of the summary now presented is in itself absurd". By the time of the 1891 census Albert and his family were living at 13 Earle Street but I lost track of him after this. In the Autumn of 1889 Albert Jnr married moved away. He worked as a Clerk in a wine merchant's shop in Stowmarket, Suffolk, later moving to Henley, Oxfordshire, and by 1901 was a wine merchant's manager, living in Henley with his wife Elizabeth and children Arthur and Leonard and their adopted daughter Nellie Claydon. 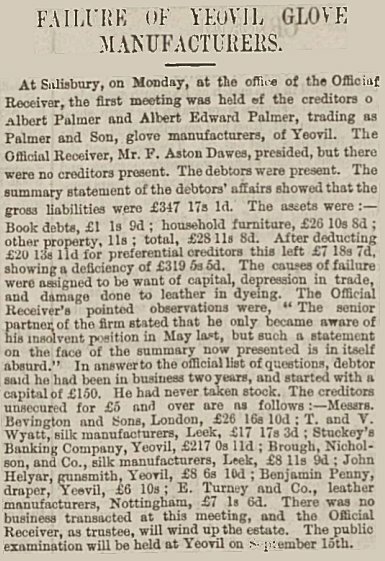 The report in the 24 August 1887 edition of the Exeter & Plymouth Gazette concerning the insolvency of Palmer & Son. The sale of Palmer & Son's stock and equipment advertised in the 27 May 1887 edition of the Western Gazette.